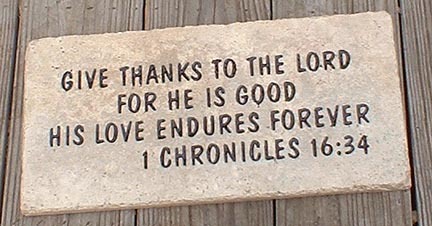 Scripturestone Plaque. 2-4 Lines. Approx. 16" x 8" x 1/2" thick. Scripturestones date back to Moses and the 10 commandments! 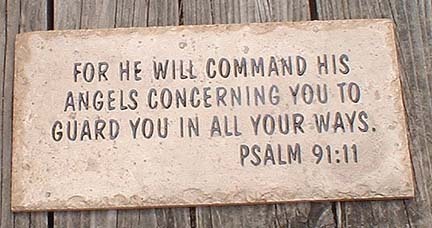 Set your favorite bible scripture in stone and place it in a prominent location. 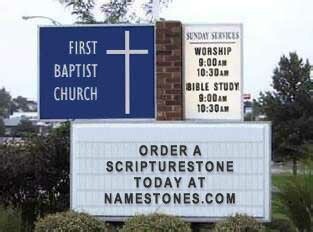 And Scripturestones make great gifts, especially around the holidays! 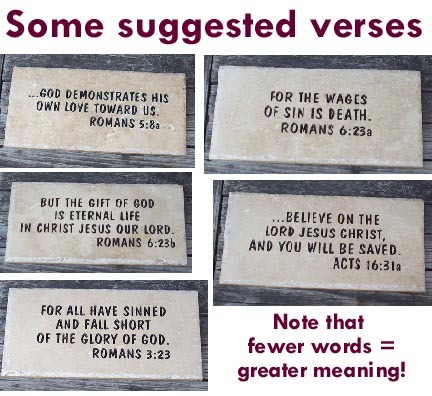 On Scripturestones, the saying goes in the first 1-3 lines, and the reference like JOHN 3:16 is automatically right-justified on the last line. Technically we can fit 72 characters/spaces on the top 3 lines, but usually can squeeze in up to 90 if needed. Just type in the scripture and we will lay it out nicely, with the biblical reference right-justified on the last line. On Scripturestones ONLY, we will automatically center whatever scripture you type in, and right justify the reference on the last line. Note: sorry, all we have are english typestyles, no hebrew. Top lines are centered- last line is right justified. Capital letters only- all same size. Typestyle and black paint are exactly as shown. No custom layouts, typestyles, logos, or paint are available. KEYWORDS: Stone sculpture carving and engraving stonemasony natural stone ... ... Cut, carved and finely chiseled, our natural stone sculptures and ... limit to the range of stone stones are engraved for interior or exterior use. This includes limestone, granite, marble and slate. Stock and custom stones for gardens, pet memorials, and celebrations. Pet Memorials, Memorials, Garden Markers .House Numbers. business signage, farm-ranch markers, lawn signs, memorials . laser engraving your favorite portraits on stone. Marble and granite are natural materials. ... concrete pet markers stone medallions stone engraving supplies stone engraving in tucson headstones in fort worth etched rock university of kentucky headstones indianapolis custom plaques in corona california headstone engraved memorial napa california engraving plaques for tombstones pet cemetary accessories chiseled rocks laser engraved limestone winston salem pet markers carved address rocks cemetary head stones tampa florida etched garden stones engraved pocket stones http //www.namestones.com/ engraved animal headstones black granite tombstones engraving name etched in stone concrete engraving elgin animal head stone markers tomb marker sayings arrow wood pet cemetery mundelein il granite grave stones address stone blocks deer head designs for grave marker richardson monuments east liverpool ohio headstones tampa fl pet memorial rocks stone funeral cocoa grave headstones liverpool island stone engraving granite monuments tampa stone monuments use stones and rock for your yard pet headstones baltimore md engraved nameplates for horses headstone ceramic pictures sandblast laser etched granite headstones engraving in anoka custom tombstones headstone engravings medals carved memorial brick grave markers pensacola florida pet cemetary marker remembrance stone plaques grave headstone fake rocks piqua animal shelter dog memorials granite stone lettering laser stone engraving orlando animal headstone sayings pet funeral sayings sandstone etching indianapolis personalized rocks stone memorials colorado springs engraving shop in warner robins ga memories etched in stone custom headstones san luis obispo california engraving headstone wv gravestones moultrie ga reading pa cemetary stones stone engravings headstones westminster cemetary stone engraving green bay wi marble sculpting blocks pennsylvania stone engraving engraved slate life is good navyballcaps ottawa dog memorials wagon hill durham nh grave yard memorial headstone designs pet memorials connecticut clarks nebraska cemetary personalized address masonry headstones jacksonville fl cremation urns buy thousand oaks ca georgia brick engraver headstone engraving brockton custom headstones and north carolina laser engraved crystal utah ut smithfield headstones in anniston alabama monuments plaques michigan stone seal engraving machine dog grave marker site www.namestones.com grave markers and monuments in raeford or fayetteville nc pet memorials houston memorial stone sandblasting memorial bench tree and dover delaware www.gravestones headstones colorado jamestown new york laser engraving cemetery stone verses professional rock engravers killeen engraving mashpee stone engraving engraved photo tags in sacramento woodbridge pet cemetary gravestones colorado springs denver engraved stone signs pricing headstones laser engraved large stone tile gravestone markers tree engraving designs stone carved house signs memorial tomb stones grave head stone cost plaques and engraving in rockford il dunn nc headstones seneca products pet markers stone rock engraving louisville ky memorials head stones headstones in pensacola florida head stone for grave side canine grave markers buy graveyard monuments in massachusetts brick engraving sacramento commemorative stone welches funeral home mocksville nc stone engraving wi marble headstones orlando etched blasted natural stone art hamster stone memorial burial monuments and stone carvings texas sandstone engraving pet cemetary in manchester connecticut pet cemetary tulsa engraved sports stone engraved address rocks nj brick engravers monument stones personalized landscaping rocks tombstones. or grave markers grave plaques etched stone heathstone engraved pebbles customize plaque tacoma wa etched glass awards raleigh nc paint for granite lithichrome natural rock engravers stone engraving in washington state asheville area stone carving engraved wedding stones boston bricks and stones.com best type of stone for headstone pet cemetary bay city michigan cast stone address plates dallas river rock engrave gravestones & markers colorado engraved rocks vancouver cost of engraving memorial stone engraving pennsylvania chambersburg carved wood signs vallejo etched glass signs plaques memorials nashville agawam massachusetts burials springfield street cemetery sterlington animal shelter if memories were a.... pet grave marker stone engraving st. louis colorado red sandstone etching brick engraving companies in south carolina grave markers and monuments in raeford or fayetteville nc peronalized garden memorial stones cheap memorial pet markers www.namestones.com dog cemetary stones address for davie funeral service chapel mocksville nc sacramento brick engraving sacramento ca clarks funeral services in abington va. dallas tx tombstone engraving memorial stones prices cumberland county nj cemetery graveyards memorial gardens grants pet headstones norfolk tombstones and monuments ottawa photo tile gravestone engraved stone large laser on granite address markers chicago il stone carving boise granite monuments markers plaques fast cemetary markers in salt lake city utah gardenstones memorial headstones texarkana tx memorial stones etching north carolina sandblasted stone sign prices headstone engraving etiquette cemetery monument companies lincoln ne glass engraving in aberdeen sd engraved rock nebraska stone engraving dubuque stone engraving in miami buy gravestones manchester nh limestone fireplace mantels in pittsburgh headstones opelousas la highland cemetary south bend pet headstone statues engraving slate remembrance phrases custom engraving rock wisconsin lasar stone engravings from china tacoma castle superstore memorial stone ct stone engraving wa terrace lawn cemetary boise stone pet statues engraved stones or rocks ithaca ny cemetery monument companies laser etching portrait window grave headstones and clinton nc stone engraving clarion pa marble etching miami engraving & stones & garden grave markers canines engraving saginaw michigan rock engraver bothell stone signs il engraving asheville tombstones in fayetteville nc gravestones in new castle delaware laser engraved brick pittsburgh discount design family memorials stone memorial companies in syracuse sandblasted monuments in jamestown pa muskogee marble and granite tombstones and pittsboro and north carolina monuments florida granite lewisburg pa. beauty solana stone engraving in austin texas pet head stone stones for cementry cheap grave stone granite etching monument stones norwood memorial plaques stone carving hollister word paint grave stone eagle monuments headstones ft pierce fl rohnert park headstones pet casket geneva il headstone prices bloomington illinois engraving tombstone ma grave markers miami fl lithichrome stone paint webtv engraved memorial stones aurora & woodstock natural stones pavers brick companies wedding engraving in elizabeth new jersey headstones tombstones oklahoma city pet yard stones cremation urns milwaukee prices custom gravestones tallahassee florida bronze memorial builders dog headstones limestone post engraving instructions monuments & markers in sussex new brunswick etched stone address marker austin texas grave head stones in newark new jersey sterling silver engraving mount airy nc stone engraving new york natural stone engraving mount vernon cemetary california plaques for dogs graves laser engraved brick charlotte ohio bronze plaques salt lake city engraved rock gift yard rock engraving dover ohio river rock pet grave markers memorial monument engraving dog grave stones laser etched concrete philadelphia memorials engraving cemetery brockton massachusetts denver awards photo plaques pet memorials rochester ny etched stone plaques rocks pet memorial tomb stone pictures of religious tombstones pet marker mold monuments claremore oklahoma san angelo headstones cleveland tombstones monuments pet cemetery wellesley address sign limestone landscape boulder engraving nebraska personalized engraved stones red rock engraved ordering a cemetary stone beloved tomb stones.com head stones hickory nc laser engraving plaques emporia ks pet grave markers uk pet cemetary las vegas nevada granite stone engraving houston texas monuments and memorials yakima wa. pet tombstone louisville sandblast rock deceased pet granite companion grave marker designs memorial stone etching designs grave markers in martinsburg wv pet burial stones brick engravement new jersey engraving prices hampton virginia plaque etching names on stone stone engraving columbus ohio grave markers & stones mn prices for a cemetary headstones in austin tx headstone markers in valdosta ga memorial benches hawaii pet cemetary supplies ontario granite engraving/ tucson engraving headstones austin headstones and monuments granite sculpting pet cremation ventura county wedding engraved vases in remembrance of deceased stone monuments city entrance texas muskogee monuments headstones dog memorial garden stone chiseled headstones engraving southern nh pictures of natural stone veneers engraved stones rumi out beryond ideas of right and wrong pet store memorial stones personalize rocks with sports teams engraved stone mailboxes monuments graves stones in gastonia shelby pet memorial engravings grave markers waycross georgia stone markers for animals engraved stones manhattan stone tile engravers nyc funeral head stones little falls granite headstones lake charles louisiana pet headstone truckee cat garden gravestones stones grave stone sayings engraving yard stones garden stone with logos artistic stone engraving fort smith ar engrave stone cedar grove cemetary in new bern nc va veteran s headstone plaques wheaton maryland head stone cemetary in houston texas grave markers nc troy sandblasting hendersonville nc concrete pet grave markers polished stone bear engraved arizona cemetary monuments boston ma affordable marble head stones tombstone statues layouts engraving & etching sterling heights michigan headstone engraving how to pet loss benches jefferson memorial cemetary and funeral home in pennsylvania wood engraved signs hinsdale fort lauderdale urn engraving name tag marble engraving san angelo texas rock engravers mn headstone designs lakeland florida granite plaques unique headstones companies uk tombstone monument sioux falls pet headstones oregon pet land papillion in fort walton stone etching denver stone engraving minneapolis woodland memorials burlington ontario pet coffins in ontario childs granite headstone etched rock signs colorado springs rocks carved with inspiration words sandblast etch owensboro caskets bloomington mn stone and granite engraving shepherdsville ky kentucky pet headstones tombstones benches stone markers nashville tennessee gravestones in cambridge springs stone haven memorials www.pet-memorial.lazyfrog.net stone engraving des moines ia laser granite engraving alabama laser etching houston how to make a tomb stone.com metal pet memorials engraved pet stone marker wedding engraving in lansing michigan ottawa pet pendant pet caskets houma laser etched grave markers in california grave stone plaque uk sandblast puppies pet memorial stones seattle wa pet grave markers columbus ohio etched stone tile dog cremation titusville graveyards in fernandina beach fl headstones tulsa ok headstone funeral aliso viejo ca memorial paver example slate pavers charleston sc format of plaque of appreciation monument granite Laser engraving photos in black marble and granite. Natural Stone Plaques Beautiful stones custom engraved for your home or garden. Custom Stone Engraving Unique gifts, garden stones. Cast Stone Engraving. natural nameplates and garden memorials . engraved slate house signs, sandblasted stone signs, engraved ... Carved in Stone. Top-quality, finely engraved stone pet memorials. We combine beautifully natural stone and unsurpassed craftsmanship to create unique and cherished keepsakes. paper weights, unique gifts, or outdoor marker stones. Address Block Cut in natural stone 6" Numbers Engraving. Personalized engraved stones river stones pet memorials garden ... ... add natural beauty to any garden or landscaped area. Our river stones are the perfect way to honor a pet. Remember your dog or cat with a engraved stone pet. Stone and Glass Engraving Deeply etched natural stone and engraved granite pet memorials. sculpting, stone engraving, stone art, stone hearts, logos, stone masonry. Engraved stone, engraved rock, Engraved natural stone, engraved natural rock . polished surfaces and precision sandblast engraving. healing stone, rock, carving, stone product. engraving services are perfect for corporate logos, appreciation or memorial natural stone engraving process. stone and glass engraved awards, plaques, donor bricks and walls, medallions. gravestones, grave markers. Carved stone gifts, garden stones, and pet memorials. Lawn, Garden and Yard accents. Engraved stone lawn, ... Oregon OR .... By Locality . Portland . By Locality . Salem . Eugene . Eugene . Salem . Lake Oswego . Corvallis . Medford . Bend . Klamath Falls . Grants Pass . Ashland . Roseburg . Springfield . Albany . Wilsonville . Florence . Newberg . Oregon City . Dallas . Bandon . Silverton . Sweet Home . McMinnville . Molalla . Welches . Pendleton . Ontario . Sandy . Milwaukie . The Dalles .... Pennsylvania PA ... Philadelphia . Pittsburgh . Erie . Harrisburg . Bethlehem . York, . Wilkes-Barre . Johnstown . Reading . Allentown . Scranton . Allentown . Erie . Norristown . Pottstown . Bethlehem . State College . Hanover . Carlisle . Williamsport . Washington . Altoona . Mechanicsburg . Upper Darby . Fort Washington . Lebanon . Boyertown . New Castle . Blue Bell . Media . Canonsburg . Beaver . Wayne . Kutztown . Butler . Chambersburg . Abington . Indiana . Broomall . Gettysburg . Easton . Bloomsburg . Meadville . Bala Cynwyd . Lewistown . Ambler . Gilbertsville . Clarks Summit . Collegeville . Camp Hill . Dillsburg . Monaca . Lewisburg . Cranberry Township . Lock Haven . Chadds Ford . East Norriton . Hershey . Bryn Mawr . Hazleton . Worcester . Shenandoah . Clarion . Shippensburg . Jenkintown . Willow Grove . Nazareth . Marple Township . Marshalls Creek . Palmyra . Sharon . Harleysville . Shickshinny . Kingston . Mercersburg . Leechburg . Stroudsburg . Pottsville . Mount Carmel .... Rhode Island RI Providence .... South Carolina SC .... Greenville . Columbia . Charleston . Columbia . Myrtle Beach . Spartanburg . Florence . Sumter . Rock Hill . Hilton Head Island . Aiken . Anderson . Summerville . Easley . Greer . Greenwood . Orangeburg . North Myrtle Beach . Gaffney . North Augusta . Mount Pleasant . Lancaster . Fort Mill . Irmo . Simpsonville . Hartsville . Powdersville . Camden . Newberry . Clinton . North Charleston . Clemson . Litchfield Beach . Blythewood . Seneca . Landrum .... South Dakota SD .... Rapid City . Aberdeen . Watertown . Sioux Falls . Brookings . Rapid City .... ... Deeply engraved prairie rock and natural stone for home, garden, parks, rest areas, ponds, paths, gift, celebration, affirmation and tributes. Headstones, Tombstones, Monuments, Grave Markers, Gravestones, ... Natural Granite stone. engraving of natural stone, marble and wood. custom engraved stone words on natural river stones, carved river rock, polished etched pocket stones, engraved animals & images. natural stone paving including bronte, yorky, whitby, paving, setts, cobbles, walling, kerbs and rockery. Say it in Stone. Pet grave markers, pet headstones, pet loss, pet memorials. natural stone. coring. cutting. engraving. chemical vapour deposition. syngrit. maxigrit. sda. sdb. diagloss. debdust. Granite Finish, Engraving Materials, Marble Finish, ... Sealants, Natural Stone, Sealants, Silicone, Stone and Marble, Slate. Corporate Plaques, Stone - UK ... Supply only of natural stone materials. Stone sealing. Granite kerbs and setts. Computerised Engraving. Specialty Stone and Glass Engraving Deeply etched natural stone and engraved granite pet memorials. Custom Engraving In Sandstone. This natural sandstone. cut and engrave pet headstones and memorials. milling, engraving, lettering, edging ... natural stone ( marble, granite ). Wordestones custom word stone engraving ... pet memorial stones, engraved garden stones, engraved garden rocks, monument stones, favors, gifts ... feelings, stress, tumbled, natural, churches, amulets ... Polished pocket stones with motivational words, names, slogans, animal figures, or logos. Companies - Engraved Brick Fund Raising Ideas ... ... brick pavers for fund raising. Engraved all natural stone materials for fund raising and donor recognition. Masonry Products. Natural Stone Veneers. Clay Brick. ... Stone Fabrication. Stone Cutting. stone Etching & Engraving. address Stones. Fundraising with Engraved Bricks, Concrete ... ... sandblasting technique enables us to engrave on any surface including brick and concrete pavers, granite, cobblestone, marble, sandstone and natural stone. STONE ENGRAVING. High quality natural stones are engraved for interior or exterior use. This includes limestone, granite, marble and slate. Stock and custom stones for gardens, pet memorials, and celebrations. Pet Memorials, Memorials, Garden Markers .House Numbers. business signage, farm-ranch markers, lawn signs, memorials . laser engraving your favorite portraits on stone. Marble and granite are natural materials. ... Stone sculpture carving and engraving stonemasony natural stone ... ... Cut, carved and finely chiseled, our natural stone sculptures and ... limit to the range of stone ornaments that ... can even add carvings and engraving. Custom engraved stone, custom engraved rock, custom engraved ... ... imagination. All deeply engraved in natural stone. Rocks, natural granite, marble, and slate ... ... Custom laser engraving. memorial plaques and natural stone memorials for outdoor use, as well as memorial engravings. unique gifts, garden stones, and pet memorials. Lawn, Garden and Yard accents. Engraved stone lawn, ... ... Deeply engraved prairie rock and natural stone for home, garden, parks, rest areas, ponds, paths, gift, celebration, affirmation and tributes. Headstones, Tombstones, Monuments, Grave Markers, Gravestones, ... Natural Granite stone. engraving of natural stone, marble and wood. custom engraved stone words on natural river stones, carved river rock, polished etched pocket stones, engraved animals & images. natural stone paving including bronte, yorky, whitby, paving, setts, cobbles, walling, kerbs and rockery. Say it in Stone. Pet grave markers, pet headstones, pet loss, pet memorials. natural stone. coring. cutting. engraving. chemical vapour deposition. syngrit. maxigrit. sda. sdb. diagloss. debdust. Granite Finish, Engraving Materials, Marble Finish, ... Sealants, Natural Stone, Sealants, Silicone, Stone and Marble, Slate. Corporate Plaques, Stone - UK ... Supply only of natural stone materials. Stone sealing. Granite kerbs and setts. Computerised Engraving. Specialty Stone and Glass Engraving Deeply etched natural stone and engraved granite pet memorials. Custom Engraving In Sandstone. This natural sandstone. cut and engrave pet headstones and memorials. milling, engraving, lettering, edging ... natural stone ( marble, granite ). Wordestones custom word stone engraving ... pet memorial stones, engraved garden stones, engraved garden rocks, monument stones, favors, gifts ... feelings, stress, tumbled, natural, churches, amulets ... Polished pocket stones with motivational words, names, slogans, animal figures, or logos. Companies - Engraved Brick Fund Raising Ideas ... ... brick pavers for fund raising. Engraved all natural stone materials for fund raising and donor recognition. Masonry Products. Natural Stone Veneers. Clay Brick. ... Stone Fabrication. Stone Cutting. stone Etching & Engraving. address Stones. Fundraising with Engraved Bricks, Concrete ... ... sandblasting technique enables us to engrave on any surface including brick and concrete pavers, granite, cobblestone, marble, sandstone and natural stone. STONE ENGRAVING. High quality natural stones are engraved for interior or exterior use. This includes limestone, granite, marble and slate. Stock and custom stones for gardens, pet memorials, and celebrations. Pet Memorials, Memorials, Garden Markers .House Numbers. business signage, farm-ranch markers, lawn signs, memorials . laser engraving your favorite portraits New Jersey NJ .... Newark . Jersey City . Hoboken . Paterson . Jersey City . Newark . Elizabeth . Cherry Hill . Millburn Township . Princeton . Union . Bayonne . East Brunswick . Passaic . Clifton . Milltown . Montclair . Marlton . Toms River . Trenton . Atlantic City . Livingston . West Orange . New Brunswick . Paterson . Wayne Township . Haddonfield . Pitman . Edison . Summit . Lawrenceville . Union City . Vineland . Medford . Nutley . Berkeley Heights . Beach Haven . Maplewood . Westfield . Roseland . Bridgewater . Weehawken . Caldwell . Millville . Pennsauken . Hamilton . Cranford . Fairfield . Metuchen . Voorhees Township . Mount Laurel . West Milford . Cape May . Glassboro . Jackson Township . Brick Township . Verona . Egg Harbor Township . Piscataway . Camden . New Providence . Point Pleasant Beach . Ringwood . Kearny . Elizabeth . Little Falls . North Brunswick . Woodbridge . Bloomfield Township . Bridgeton . Point Pleasant . Merchantville . Seaside Heights . Mount Holly . Cedar Grove . Highland Park . Plainsboro . Pennington . Bloomingdale . Lambertville . Hillside . Old Bridge . Short Hills . Haddon Heights . Linden . Audobon . North Bergen . Wanaque . Martinsville . Hillsborough Township . Moorestown . South Plainfield . Rahway . Absecon . Phillipsburg .... New Mexico NM .... Albuquerque . Las Cruces . Santa Fe . Farmington . Gallup . Roswell . Alamogordo . Clovis . Rio Rancho . Las Vegas . Los Lunas . Grants . Artesia . Taos . Carlsbad . Silver City . Belen . Hobbs .... New York NY .... New York . Rochester . Buffalo . Buffalo . Syracuse . Rochester . Yonkers . Hicksville . Albany . Syracuse . Utica . Schenectady, . Port Washington . Montauk . Huntington . Saratoga Springs . East Northport . Troy . Yonkers . Croton On Hudson . Niagara Falls . Great Neck . East Hampton . Sleepy Hollow . Binghamton . White Plains . Southampton . Manhasset . Amityville . Ithaca . Hawthorne . Liverpool . Poughkeepsie . Amherst . Baldwinsville . Springville . Sag Harbor . Auburn . Syosset . Plattsburgh . Hamburg . Red Hook . New City . Watertown . Oswego . Newburgh . Farmingdale . Lockport . Long Beach . Cheektowaga . Shelter Island . Plainview . Westbury . Rhinebeck . Amagansett . Canandaigua . Garden City . Northport . Westhampton Beach . Middletown . Scarsdale . Gowanda . Warwick . Williamsville . Colonie . Massapequa . Oyster Bay, Town of . New Rochelle . Nanuet . Nyack . Pearl River . Clarence . Amsterdam . Clifton Park . Brewster . Bay Shore . Endicott . Vestal . Kingston . Batavia . Yorktown Heights . North Tonawanda . Commack . Lindenhurst . Hempstead . Bethpage . Wantagh . Hamilton . Jamestown . Port Jefferson . Oneonta . Mahopac . Alexandria Bay . DeWitt . Goshen . Lake George . Liberty . Tonawanda . West Seneca . Rockville Centre . Tuckahoe . Ardsley . Hampton Bays . Johnson City . Geneva . Webster . Alden . Baldwin . Armonk . New Windsor . Herkimer . Larchmont . Mount Kisco . Mount Vernon . Tarrytown .... on stone. Marble and granite are natural materials. ... Laser engraving photos in black marble and granite. Natural Stone Plaques Beautiful stones custom engraved for your home or garden. Custom Stone Engraving Unique gifts, garden stones. Cast Stone Engraving. natural nameplates and garden memorials . engraved slate house signs, sandblasted stone signs, engraved ... Carved in Stone. Top-quality, finely engraved stone pet memorials. We combine beautifully natural stone and unsurpassed craftsmanship to create unique and cherished keepsakes. paper weights, unique gifts, or outdoor marker stones. Address Block Cut in natural stone 6 Numbers Engraving. Personalized engraved stones river stones pet memorials garden ... ... add natural beauty to any garden or landscaped area. Our river stones are the perfect way to honor a pet. Remember your dog or cat with a engraved stone pet. Stone and Glass Engraving Deeply etched natural stone and engraved granite pet memorials. sculpting, stone engraving, stone art, stone hearts, logos, stone masonry. Engraved stone, engraved rock, Engraved natural stone, engraved natural rock . polished surfaces and precision sandblast engraving. healing stone, rock, carving, stone product. engraving services are perfect for corporate logos, appreciation or memorial natural stone engraving process. stone and glass engraved awards, plaques, donor bricks and walls, medallions. gravestones, grave markers. Carved stone, carved rock, etched stone, etched rock from ... All deeply engraved in natural stone. Laser engraving photos in black marble and granite. Natural Stone Plaques Beautiful stones custom engraved for your home or garden. Custom Stone Engraving Unique gifts, garden stones. Cast Stone Engraving. natural nameplates and garden memorials . engraved slate house signs, sandblasted stone signs, engraved ... Carved in Stone. Top-quality, finely engraved stone pet memorials. We combine beautifully natural stone and unsurpassed craftsmanship to create unique and cherished keepsakes. paper weights, unique gifts, or outdoor marker stones. Address Block Cut in natural stone 6" Numbers Engraving. Personalized engraved stones river stones pet memorials garden ... ... add natural beauty to any garden or landscaped area. Our river stones are the perfect way to honor a pet. Remember your dog or cat with a engraved stone pet. Stone and Glass Engraving Deeply etched natural stone and engraved granite pet memorials. sculpting, stone engraving, stone art, stone hearts, logos, stone masonry. Engraved stone, engraved rock, Engraved natural stone, engraved natural rock . polished surfaces and precision sandblast engraving. healing stone, rock, carving, stone product. engraving services are perfect for corporate logos, appreciation or memorial natural stone engraving process. stone and glass engraved awards, plaques, donor bricks and walls, medallions. gravestones, grave markers. Carved stone, carved rock, etched stone, etched rock from ... All deeply engraved in natural stone.